Help bridge the gap between research and health care decisions. Join a team where you can make a difference, influence decision-makers, and effect positive change. Help us to improve the health of Canadians today and tomorrow by applying for one of our challenging and rewarding career opportunities. CADTH makes a difference in the lives of Canadians. We’re a small, behind-the-scenes organization making a big contribution to health care in Canada. Our team of dedicated professionals provides impartial evidence to help decision-makers in health care choose health technologies that will offer the best outcomes for both patient health and the health care system. If your area of expertise is in clinical research, health economics, knowledge exchange, or as a Liaison Officer, you can contribute by exploring and communicating complex clinical and economic research. If you’re a specialist in information technology, information management, human resources, finance, marketing and communications, or administration, you can play an important role supporting the overall success of our organization. 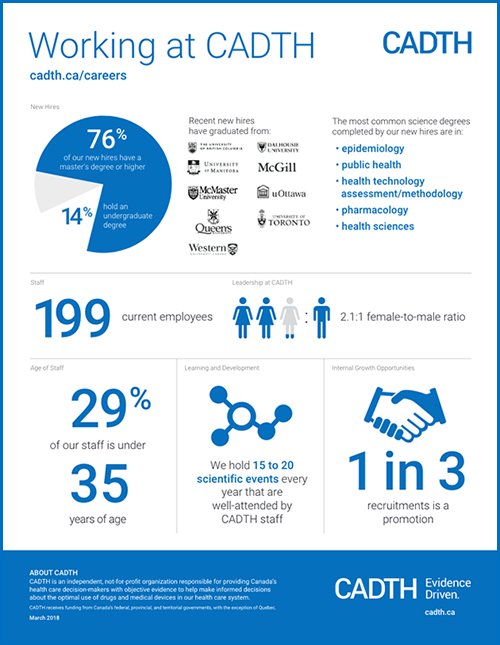 CADTH will make a difference in your career. CADTH is committed to providing our staff with opportunities to grow and realize their full potential in an environment where they can participate fully, maximize learning, and balance all aspects of their lives. an eco-friendly culture that supports community activities and programs.